In 2013, the ASCOBANS Secretariat partnered with NGOs Whale and Dolphin Conservation (WDC), NABU and OceanCare for a competition targeting German-speaking areas. 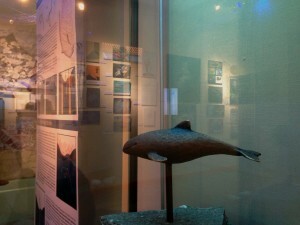 With the theme “The Last 300”, creative minds were given the opportunity to explore through their art and design work the importance they personally gave to having these unique animals in the Baltic Sea. Ninety-four entries were submitted and displayed on the dedicated website www.schweinswal.eu, wherethe public was asked to vote. After this, a jury chose three winners from the ten entries with the highest number of votes. The winner of the competition was 15-year-old Laura Stattkus, who produced a stop motion film entitled “Hello, little whale”. The majority of the art and design work submitted for the creativity competition was shown in an exhibition in the German Oceanographic Museum in Stralsund from January to April 2015. The exhibition, which was composed of pictures, sculptures, video and sound installations, was integrated into the round tour visitors take through the museum, which had about 35,000 visitors during that time period. Information material was made available in the exhibition room. The majority of exhibits remain available for display. Please note that it is most suited for German-speaking areas, since many of the exhibits make use of language, both spoken and written. If your institution is interested in showing the exhibition or part of it, please contact the ASCOBANS Secretariat (ascobans.secretariat@ascobans.org).